Recommended more to James Bond fans for the presence of series one-shot George Lazenby and connoisseurs of terrible English-language dubbing than to the kung fu buffs who’ll be drawn in by a couple of key names in the cast, A QUEEN’S RANSOM is Golden Harvest’s attempt at an international thriller along the lines of THE DAY OF THE JACKAL, RUSSIAN ROULETTE, and HENNESSY. It has something of a bad reputation, probably due to the export version that I’m reviewing here, but is an entertaining time killer as long as you’re not expecting an abundance of martial arts action. A letterboxed, sub-titled DVD and VCD can be purchased from online vendors or at Chinatown DVD shops, but nostalgia for the teen years I spent in front of the TV on Saturday afternoons drove me to this cropped, horrendously dubbed transfer. Pic reached U.S. grindhouses in 1981 as THE INTERNATIONAL ASSASSIN, courtesy of World Northal, and was already part of the company’s “Black Belt 2” television syndication package (as INTERNATIONAL ASSASSINS) by March of that year. The serpentine story takes place during May of 1975, an especially hectic month in Hong Kong history. After accepting over 130,000 Indo-Chinese refugees who were fleeing communist takeover in Vietnam, Laos and Cambodia, the United States closed its doors and forced the remaining 12,000-to-18,000 to pour into makeshift camps in Malaysia, Singapore, South Korea, Thailand, and – yes – Hong Kong. At the same time, Queen Elizabeth II became the first reigning monarch to visit the colony in 133 years of British rule, an event that required massive amounts of police and military security. 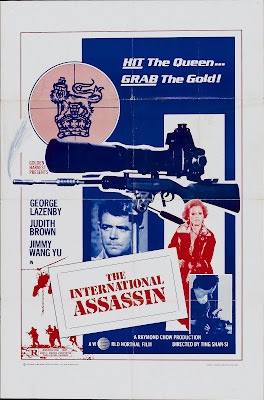 Into this powder keg comes Belfast IRA killer George Walsh (Lazenby, hilariously voiced by a whiny Brit who only tries for an Irish brogue in every third scene) and his motley band of international assassins -- familiar faces include Jimmy Wang Yu, Bolo Yeung and American starlet Judy Brown (THE BIG DOLL HOUSE, WOMEN IN CAGES) -- who are apparently in town to kill the Queen at any cost. But with a Cambodian princess (Angela Mao) and all of her riches stowed away in a nearby farmhouse, any halfway attentive viewer will know where this is going by the midway point. Other plot twists are competently handled and won’t be spoiled here. Director Shan-si Tung has a lot to juggle and manages to keep most of it in the air for the full 96 minutes. Others in the cast are Tien Ni a.k.a. Tanny (from the BLACK MAGIC movies and CLEOPATRA JONES AND THE CASINO OF GOLD), Dean Shek, Lung Chan, Chun Hsiung Ko, and - although I never actually saw him - Sammo Hung. Lazenby, who had already done one movie each with Mao (STONER) and Wang Yu (THE MAN FROM HONG KONG), was next seen in KENTUCKY FRIED MOVIE and Al Adamson’s DEATH DIMENSION.